The sixth book in the thrilling, highly acclaimed Vampire Gene series, mixing horror, dark fantasy and a slice of science fiction. Dreams and music touch people’s lives, and are the most powerful allure for those who can use them. Something hidden is sending a siren song out into the world, seeking help, and enticing those who can hear with tales of Jewel, a beautiful young woman, and her struggles on a 19th Century plantation in America’s deep South. Young lovers Ffion and Geraint find themselves drawn across the sea from North Wales to Nevada and then to New York … and in that city, Mariele Cole also hears the siren song and is compelled to speed up the demolition of an old building to make way for a new high-rise … as something is buried beneath. Meanwhile in Stockholm, John Noble and Father Declan use the resources of the Knights Templar to search for a missing vampire family and their former colleague Anthony. 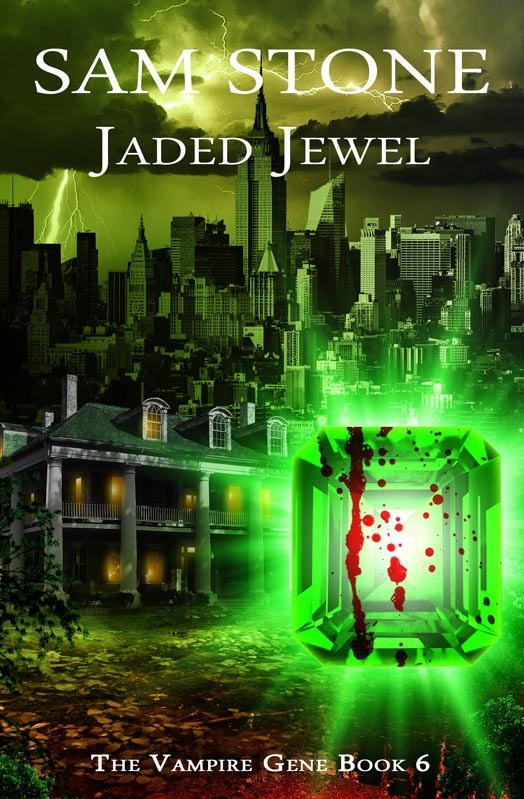 Jaded Jewel is a powerful novel of love, loss and obsession, of power and of the struggle to survive. Sam Stone makes a triumphant return to the hypnotic and compelling world of the Vampire Gene.